So, the Fresh Stitches’ Knit and Crochet Design Week has kicked off. It’s a great little idea – seeing how other people design is always interesting. Of course I’m being difficult and writing one large post for the entire week. My aim here was to come up with a cardigan design that I can use with a bag of merino wool I have in my stash. Time to lay my designing process bare to the world! I work in the engineering industry by day, and there are certain aspects of the professional design process that I think apply just as well to clothing, e.g. working out the functional specs, material properties, choosing construction methods to overcome the limitations of the former. So I make no apologies for employing the cold-hearted engineering logic to which I am accustomed. This design starts with the material of course – Sublime Extra Fine Merino DK in Sesame. -It’s stretchy, but not very elastic, so the edges are prone to distortion. But I still can’t get out of knitting a tension square! My knitting technique has sped up considerably since that last jumper so there’ll be a difference. I’m not about to disengage the right side of my brain just yet. I insist on getting the functional considerations sorted out first. It’s like drawing out the black lines before you start colouring inside them. Not only do I need to figure out what I want from this cardigan, I need to figure out what I don’t want. So on the ‘Want’ list: I want a fitted, short-sleeved cardigan with a fairly deep round neckline. I want it to be quite plain, partly so I can knit it faster and partly because I think bright colours don’t need a lot of fussy detail behind them or you start looking crazy. I want some decoration, but I want it to be very geometric and maybe a bit retro to suit the colour. And on the “Definitely not” list: No openwork or large cables. I don’t want to have to carry extra equipment about with me to knit it. I don’t want too much ribbing. I don’t want any bulky cast on/off methods. No pockets either! It quickly became obvious that I would have to knit this pattern perpendicular to the original embroidery stitch because of the natural angles in knitting. The size on the other hand, needed a little experimentation. I wasn’t entirely happy with those smaller repeats – they pull together very tightly and look messy. So I doubled the pattern up and the motif became much clearer. It also seems like it would best work as an all over pattern. It’s an 18st repeat that will never match up exactly with the ribbing I’ve included in the swatch so I will likely use an irregular ribbing pattern instead. I like it when things align! So, time to consider techniques. This is a very simple cardigan so the shaping doesn’t need much thought. Just take some stitches away at the sides and you’re done! But the yarn has properties that need to be mitigated. Areas of high stress – the sleeve cuffs and button band – will get distorted quickly if I’m not careful. For the sleeves cuffs, I’ll use twisted ribbing, which has more structure. I’ll also make the sleeves short enough that they sit just above the elbow, away from all the movement. The buttonband is more of a problem. I want this cardigan to fit closely, but I can’t have it gaping at the front! I am going to try reinforcing the band with a length of ribbon, which I’ve read plenty about but never actually tried. Now my dears, the design is roughly in place. 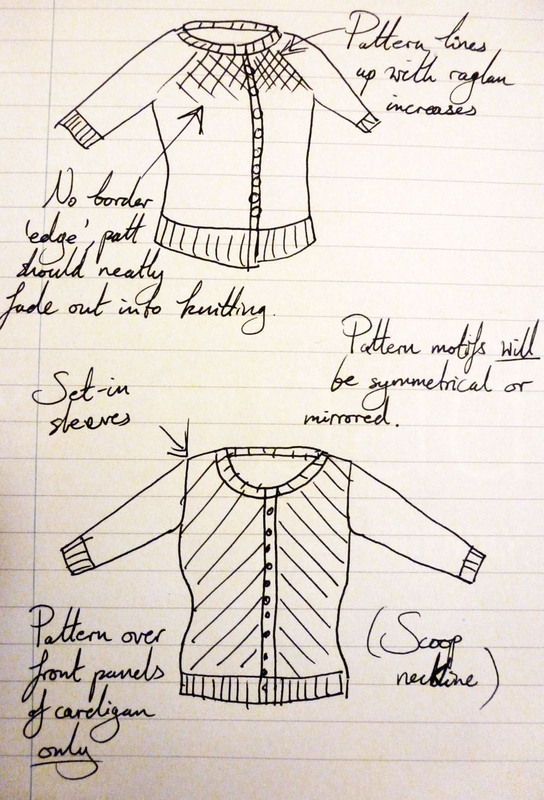 I don’t think I’ll make this into a published pattern, especially as that colourway is discontinued, but it’ll still be my first ever cardigan designed from scratch. I consider that a milestone of sorts. I still have to work out the actual stitch count but that is a task for the next few weeks. I’ll make sure to post pictures! If you can’t wait for pictures…maybe read the design posts of everyone else who took part this week? Oh, that cardigan is going to be stunning! Thanks so much for sharing!